Looking for one of a kind Star Wars fashion that you can rock with galactic pride? I found these Han Solo and Wookiee heels and they are to Star Wars shoes DIE FOR. There are CUSTOM MADE and available on Etsy. Click here to check out the shop. These Han and Wookiee heels need about 3-4 weeks to be worked on – so if you need them for a special Star Wars event, order them today! The rate? $200. But look… I think it’s worth it! Especially if you are a SUPER FAN of the franchise. These heels are absolute perfection! 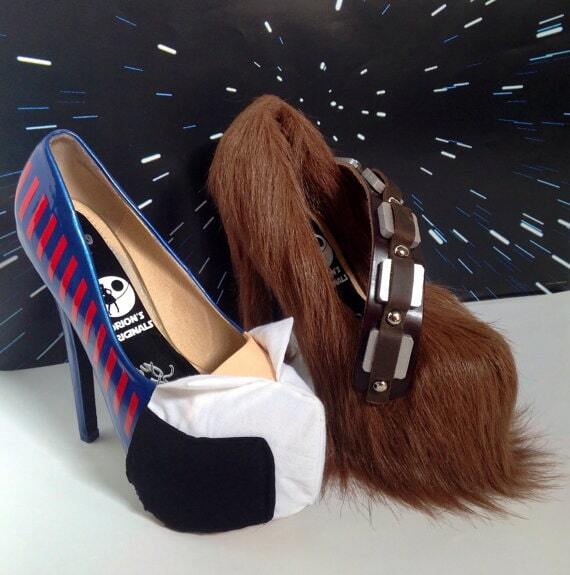 Look at the Wookiee heel… can you stand it?! It’s literal perfection. Orions Original is the BOMB. Their shop is filled with custom heels from movies like Wonder Woman, Star Wars, X-Men and then more. You HAVE to check them out. Super talented artists that are just waiting to be snagged up by a big retailer and then find fame and fortune for SURE. Get your Star Wars shoes before they make it big time, then are impossible to get your hands on! Every superfan needs a pair of these! PLEASE NOTE – you have to be really careful while walking in these heels, as naturally, they need to be handled with care.